On our first full day in the Tuscon Mountain (west) District of Saguaro National Park, we decided to do a day hike to Wasson Peak, the highest point in that district, at 4,687 feet. When we left for the hike at 8:30 a.m., it was already HOT. We wished we had left earlier. But there was no turning back, since we were only there for a week. 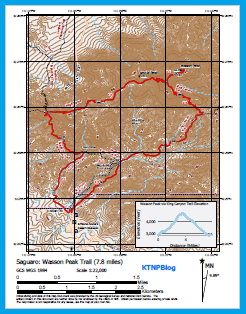 Multiple trails go to Wasson Peak, but we chose to go via King Canyon Trail, so we could form a 7.8 mile loop. 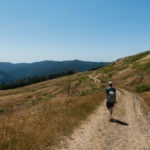 This hike isn’t easy, with the heat and elevation gain of almost 2,500 feet. After a short drive from Gilbert Ray Campground, we pulled into an unmarked parking lot just past the Arizona-Sonora Desert Museum. There were a few other cars already parked there. If parking does become an issue, I guess you could park at the museum, though they probably frown on that. 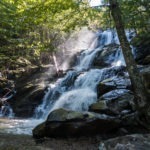 It was a great day, if a little hot, to get a hike in. I immediately saw my first Saguaro flower – in the parking lot. 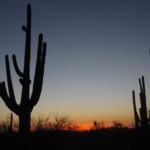 Sadly, it would be the only blooming Saguaro I’d see that day (for reference, we were there on April 15). As we walked toward the trailhead, we realized there were two trails: King Canyon trail on the right, and King Canyon Wash trail that goes to the left. A wash, we learned, is a low, sandy trail that becomes a stream or river during monsoon season (June 15 – Sept 30). We headed right to avoid the sand, though the two trails would later converge. 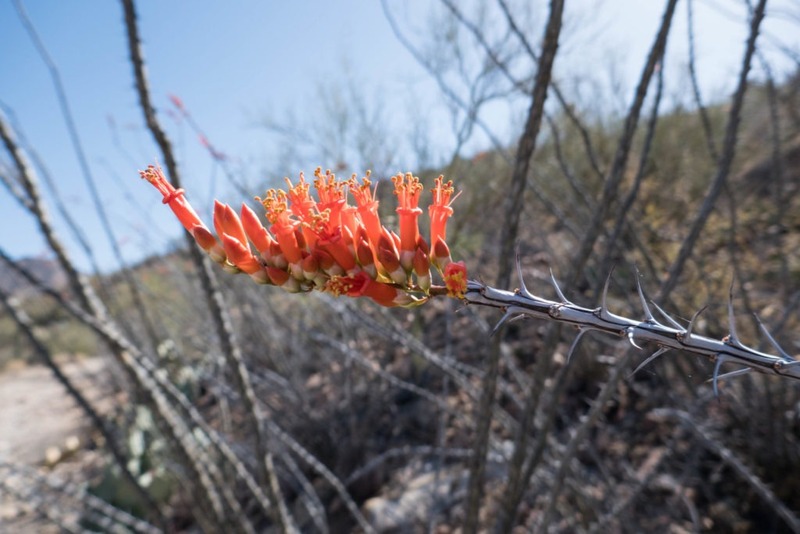 The trail initially is an old gravel road and as we hiked, we started to notice plants we had seen the day before at the Arizona-Sonoran Desert Museum, like ocotillo. Our experience at the museum helped us identify holes and scars in saguaros, the skeletons of dead cacti, and cactus boots caused by damage from woodpeckers that made their homes in saguaros. The trail also had gorgeous views of the surrounding mountains. Beautiful red ocotillos (Fouquieria splendens) give the desert a pop of color. Each plant has multiple long stems with a cluster of red flowers at the end. They bloom March through June. 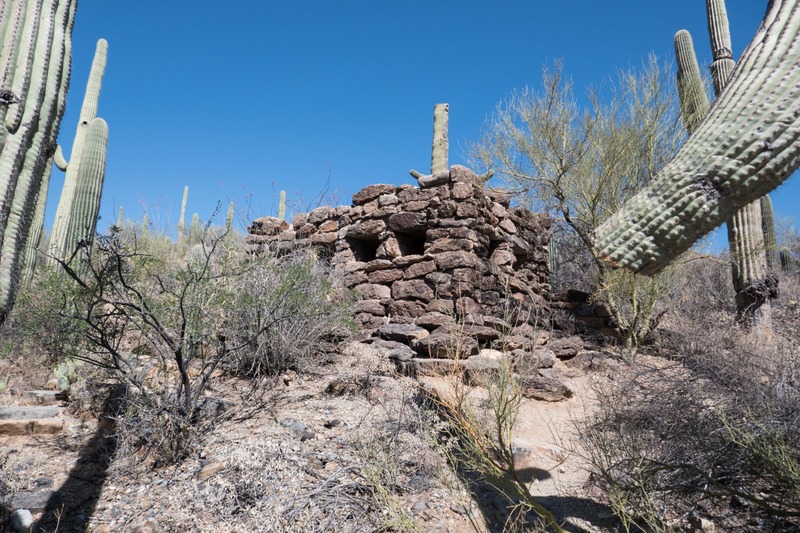 Near the junction of King Canyon Wash Trail and King Canyon Trail, we came upon an old stone structure. This defunct restroom was built by the Civilian Conservation Corp (CCC) in the 1930s. Nearby, and up a short trail, is the Mam-A-Gah Picnic Area. There are grills, in case you want to cart in a few slabs of meat, as well as a sheltered picnic area lined with dead saguaro cacti. We took the opportunity to rest in the shade of the picnic area while taking in the view. It’s the only picnic area in the park that requires hiking to get to! 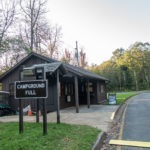 Like the old stone restroom, the picnic area was built by the CCC in the 1930s. 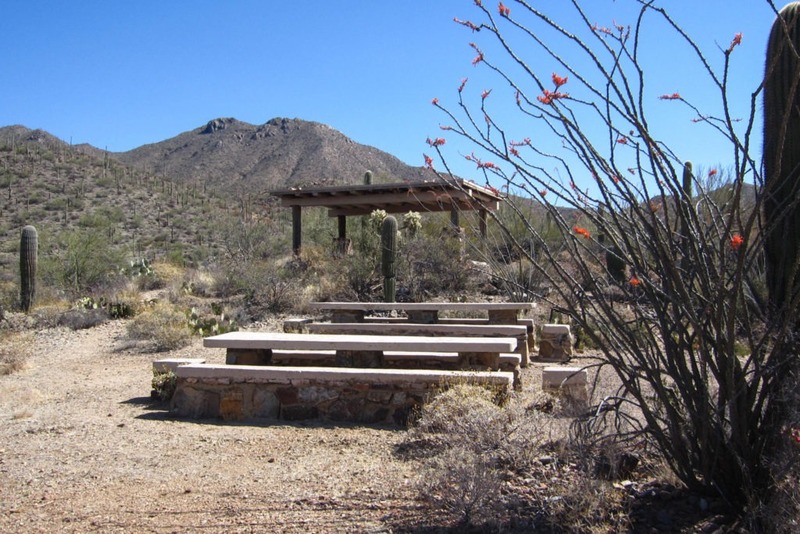 Mam-A-Gah picnic area was named after a Tohono O’odham Indian Chief. 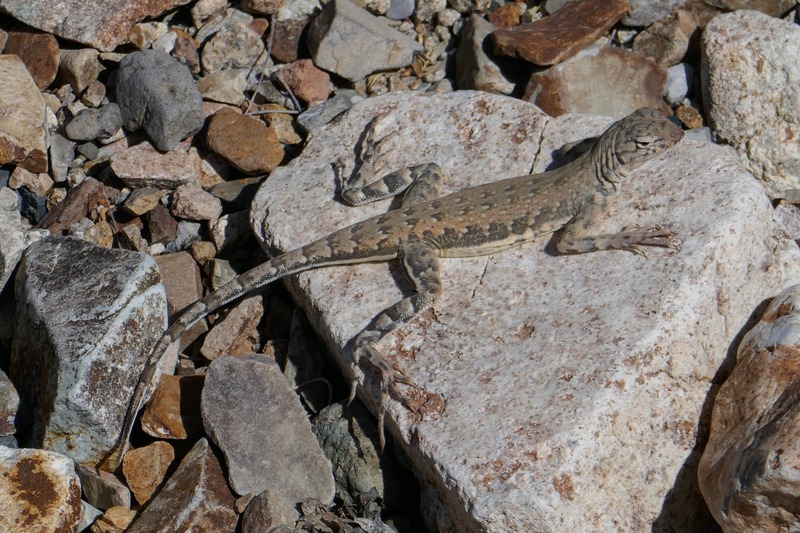 Continuing on, we crossed paths with our first lizard. These guys would be darting across the trail quite often as we hiked along, but it was novel the first time we came across one. It was nice enough to let me take some photos of it. At this point we were crossing a wash to continue onto the King Canyon Trail. We didn’t know it, but there are also some petroglyphs nearby in the wash. We wish we had known about it, instead of finding out after! This is the old stone restroom built by the CCC in the 1930s. We didn’t know what it was when we first stumbled upon it. Part of the shelter in the Mam-A-Gah Picnic Area. 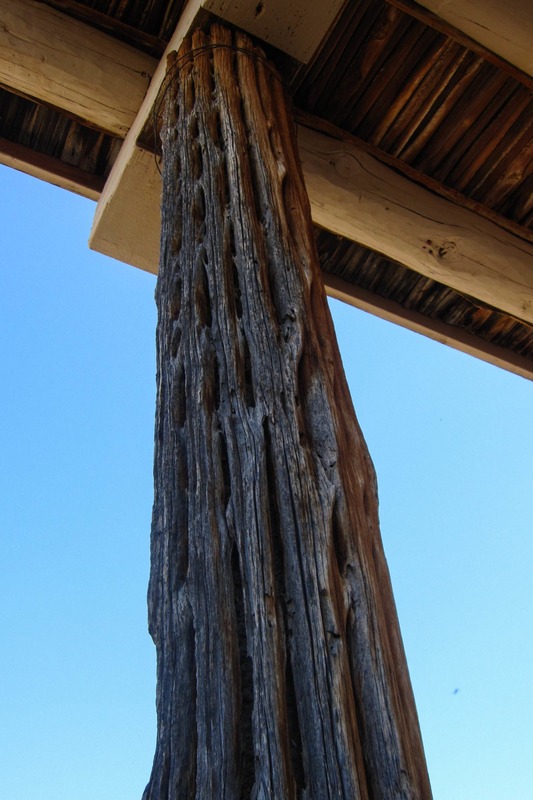 This pole is the “skeleton” of a saguaro. After our slight detour, we continued to gain elevation on King Canyon Trail. Along the way we saw plenty of saguaros, great views, and some flowering cacti. There weren’t many other hikers on the trails, but we saw a few other groups. We passed the intersection with Sweetwater Trail, which is another route to Wasson Peak. At this point, we were famished. We ate our lunch of tuna and crackers in the shade of a single saguaro. As the sun continued to rise, it threatened to take away even this tiny bit of shade. Fortunately, we were able to finish our lunch without being completely exposed to the sun, and we continued on. You know that saying, “it’s hot, but it’s a dry heat?” Well, it’s not true. 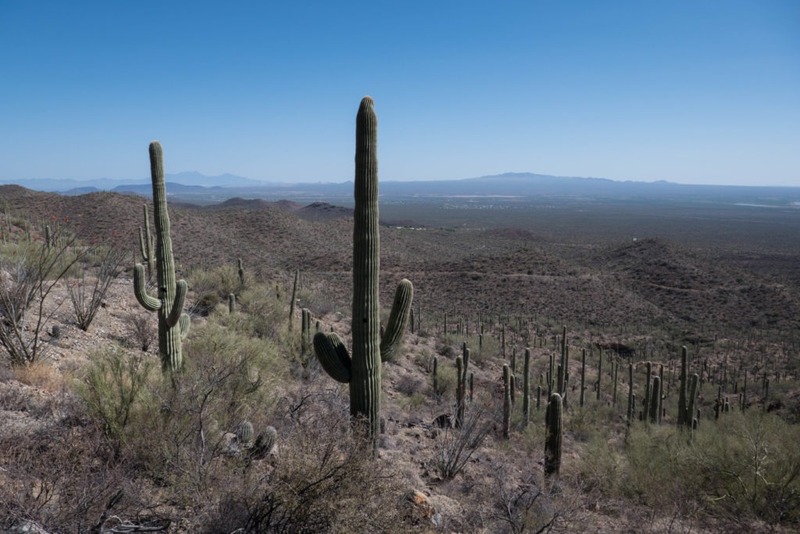 In the Sonoran desert, there are virtually no trees to provide shade except maybe an occasional palo verde tree, so it’s really….just hot. And since it is a dry heat, you need to carry a heavier load to accommodate extra water. The landscape slowly changes as you ascend. There are fewer saguaro, and we started seeing jojoba bushes, which we had learned about the previous day at the museum. So we highly recommend you go beforehand! It was fun to search out the different plants we had learned about. 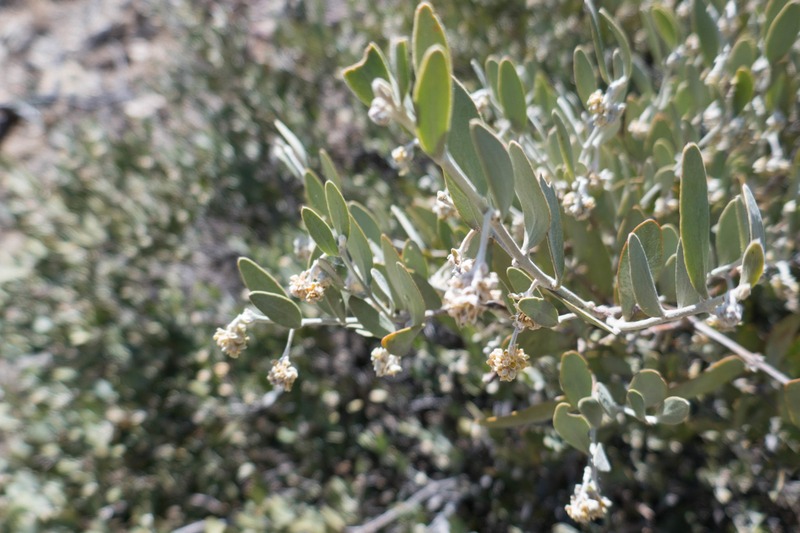 Jojoba bushes are unique because they are dioecious – the plants are either male or female. The male plant has yellowish-green flowers which pollinate the small acorn-shaped seeds that come from the flowers on the female plant. 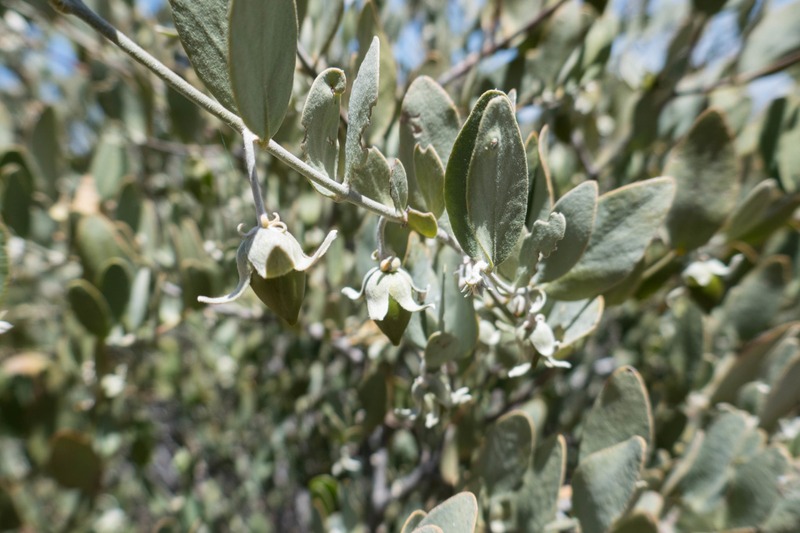 The seeds contain Jojoba oil, which is used in personal care products. A bird probably pecked this hole in the Saguaro. 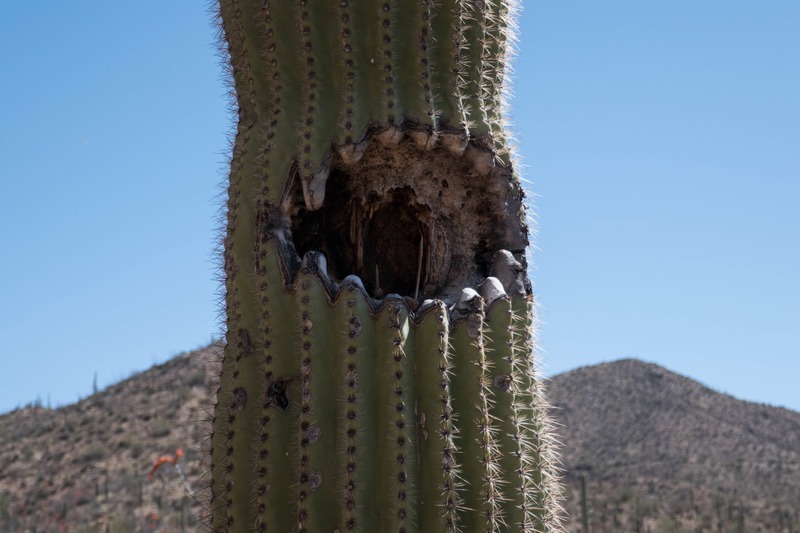 The Saguaro then develops a hard shell inside the wound (called a boot), providing a nesting place for the bird. This section of the King Canyon Trail was grueling, and we took breaks where we could find shade – either from saguaros or from a few rock outcroppings. Our destination was in sight though – we could see Wasson Peak, more or less. 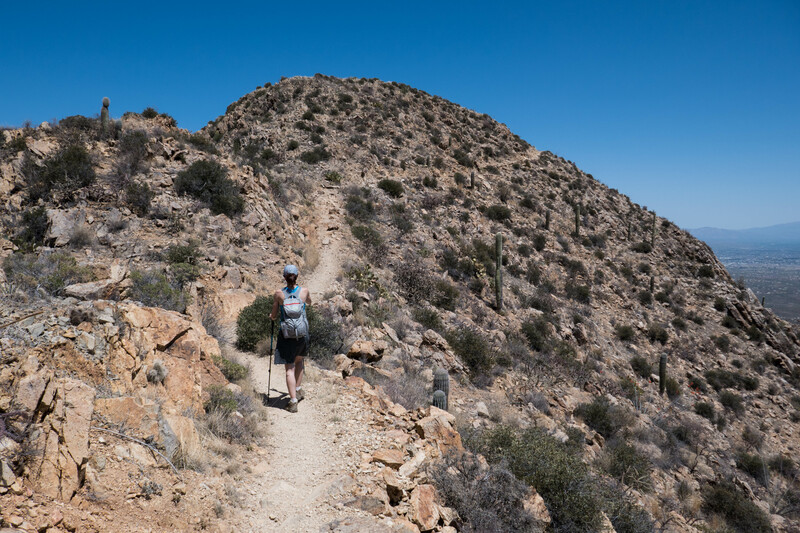 Our next intersection was with the Hugh Norris Trail, which leads to the top of Wasson Peak. At this point, we only had 0.3 miles to go. At the top, there was an amazing 360 degree view and a breeze which provided some relief from the heat. Luckily we had stopped to reapply sunscreen, because we were still completely exposed to the sun. We had the summit to ourselves, apart from one butterfly. We took a break, ate a snack, snapped some photos, and headed back down. We made a loop, so we didn’t go back down the King Canyon Trail. Instead, we joined together the Hugh Norris, Sendero Esperanza, and Gould Mine (not a typo) trails. The journey down from Wasson Peak was pretty similar to the way up, but was still a nice hike. It was getting later in the day, so we played games with the sun as we sought shade every so often. 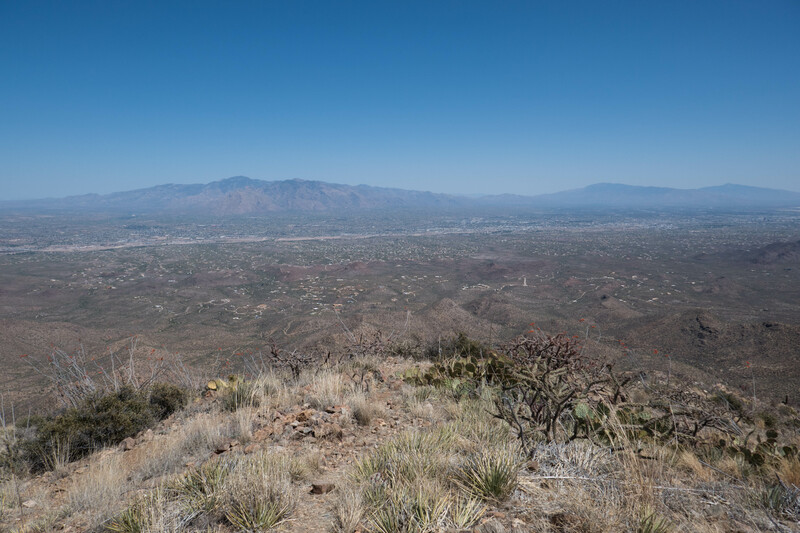 In the distance, we could see the Arizona-Sonora Desert Museum. The Gould Mine Trail was the last trail along our route. Saguaro National Park was not left “untouched” before it became a park. A lot of mining and grazing went on beforehand, and continued after it became a National Monument. Evidence of the park’s history is scattered throughout the area. We found several mines; most were just huge holes in the ground, with some remnants of stone buildings. The Gould Mine was a copper mine founded in 1906, and then shut down in 1908. The view from Wasson Peak. Look at how gorgeous it is! 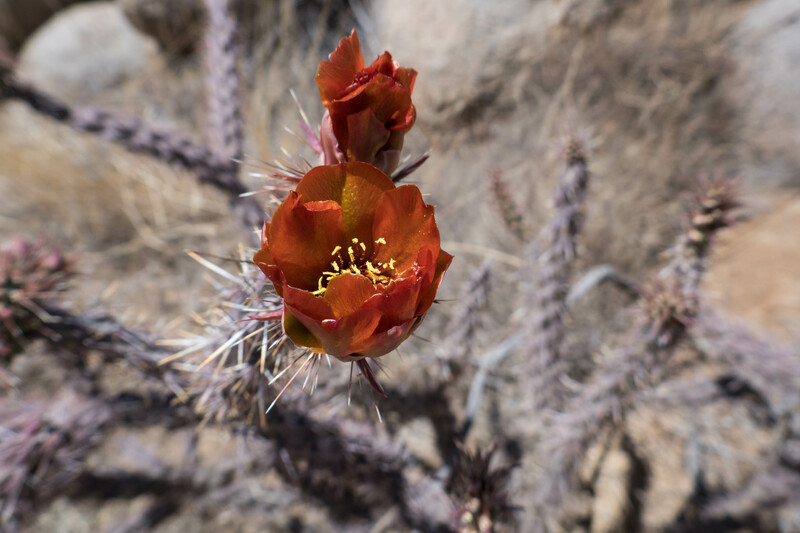 Buckhorn Cholla (Cylindropuntia acanthocarpa) on the Hugh Norris Trail. It has many branches, each with a red or yellow flower at the end. It flowers in April and May. Various old mines dot the scenery. 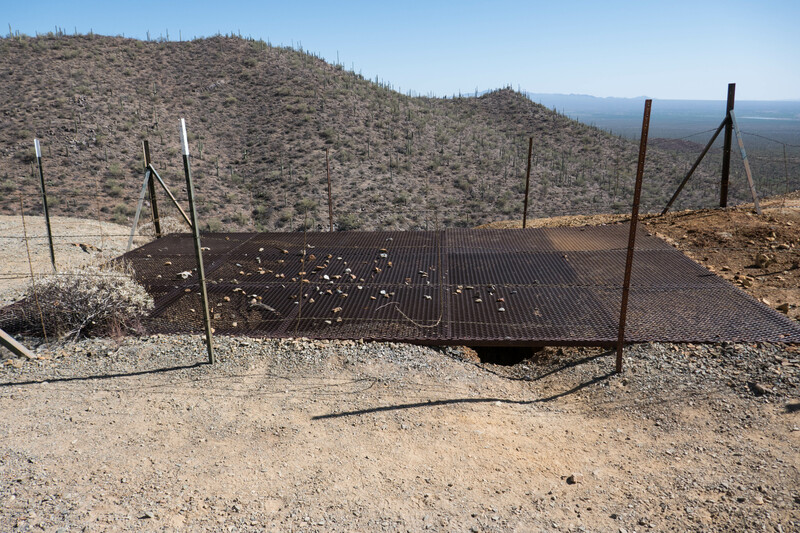 This Gould Mine shaft is located along the Sendero Esperanza Trail. When Gould Trail ends, it’s only a short uphill hike on the King Canyon Wash Trail, and then you’re back at the parking lot. 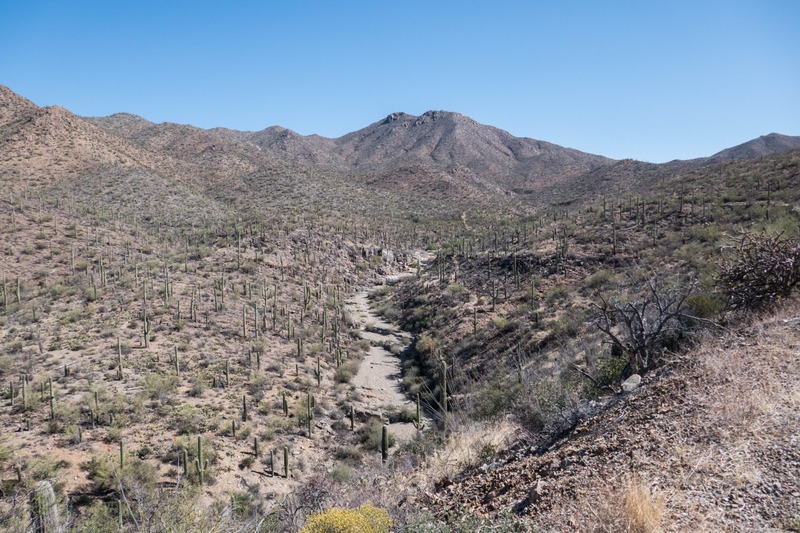 This turned out to be our favorite hike in the western section of Saguaro. The views were incredible, and the breeze was nice too. 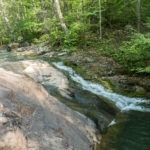 Perhaps partly because it was our first hike in the park, but I’d still love to hike it again someday. We got back into our car, where we saw that we had made a fatal mistake – we had left two bananas in there. They had baked and turned jet black due to the heat. Just another reminder of how hot it can get here. Our stomachs growling, and our bananas trashed, we set off in search of food. Trail Markings: There are no blazes, but the trail is well defined. You might see a couple cairns, and there are signs at intersections. Mile 0.0 – Continue to the back of the parking lot. Keep right for King Canyon Trail. To the left is the King Canyon Wash Trail – which you could also take, if you prefer walking in sand. 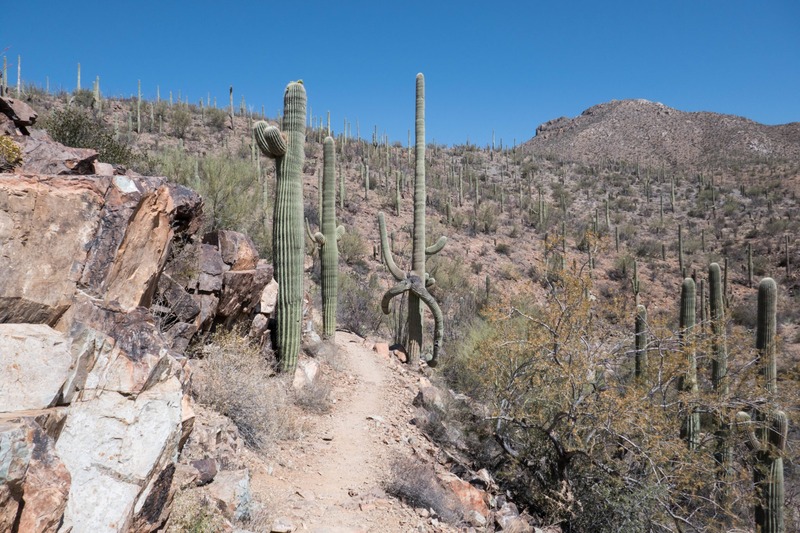 Mile 0.9 – The trails are a bit messy here, but you’ll continue on the King Canyon trail. Follow the signs. The King Canyon Wash Trail merges with King Canyon Trail here, and there are side trails as well. We recommend checking out the Mam-A-Gah picnic area while you’re here. Mile 2.3 – Sweetwater Trail intersects with King Canyon trail. Make a left, and continue climbing on King Canyon Trail. Mile 3.2 – From here you can see the summit, so head right on Hugh Norris Trail. Mile 3.5 – You’re at the Wasson Peak Summit! Enjoy the view! Then continue back the way you came. 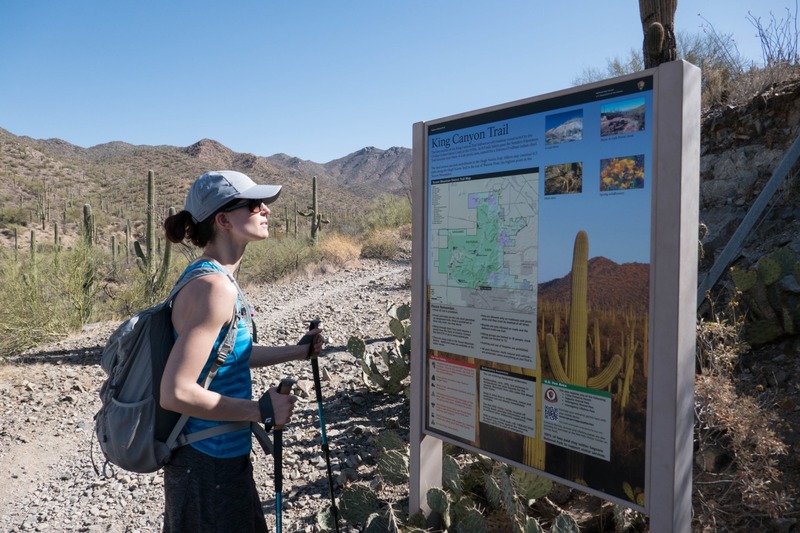 Mile 3.8 – Back at the intersection of King Canyon and Hugh Norris trails. Continue straight onto Hugh Norris Trail. Mile 5.7 – Take a left turn onto Sendero Esperanza Trail. Mile 6.7 – Turn right onto Gould Mine Trail. 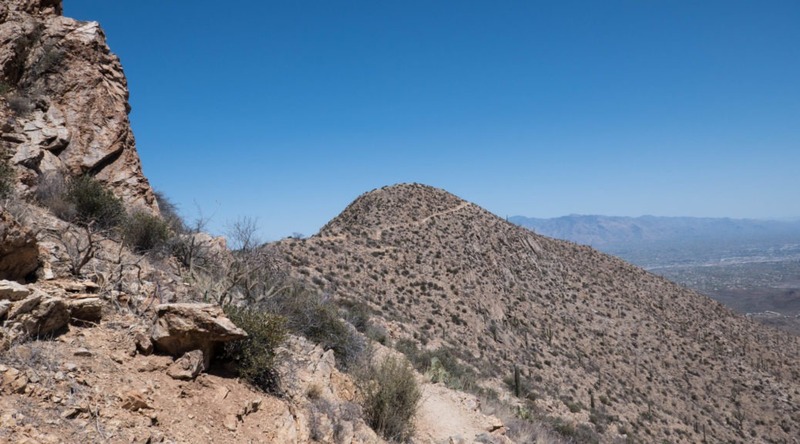 Mile 7.8 – Gould Mine Trail runs into King Canyon Wash Trail. Hike up the sloped sandy hill, and you’re back at the parking lot! It takes us awhile to write a blog post. We visited Wasson Peak on April 15, 2017.